Building Character and Preventing Bullying* provide values education which focuses on the development of good character through trust, respect, responsibility, and fairness. The Building Character chapter also provides students with information on being a good citizen. Part of character education includes recognizing bullying and understanding how bullying impacts teens. The Bullying and Cyberbullying chapter also provides students with strategies to prevent bullying from occurring or to stop bullying as it is occurring. *Each print module contains the same front matter section, titled Your Health and Wellness. This content is relevant to the entire program. 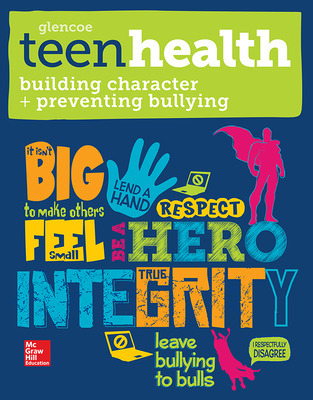 It teaches the 10 Health Skills that are the foundation of the Teen Health program.